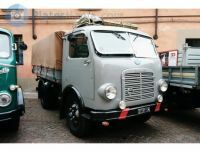 In 1947, Lancia Veicoli Industriali (Lancia Commercial Vehicles) introduced the Esatau, a full line of heavy trucks and tractors. The production of the Esatau bus and coach chassis started two years later. 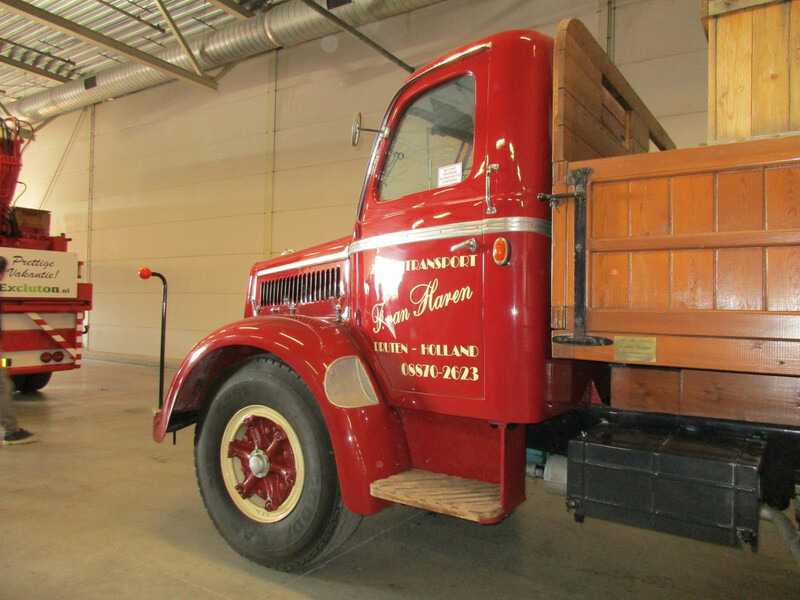 The series’ first model, called the Esatau 864, was also Lancia’s last conventional truck and tractor model. The 864 was a 4×2 chassis, whereas the 964 was a 6×2. These wonderful conventionals were offered till 1957. At that time, the Lancia Esatau A cabovers -introduced in 1955- were already roaming the Italian roads. In 1963, the Esatau was replaced by the Esagamma. Most of the cabs of the 864/964 were built by the Viberti company. From 1947 to 1956, Lancia also offered a military version of the Esatau 864, the 6Ro, which looked as awesome as the civilian truck. In Italy, the sign on the cab’s roof meant that the vehicle towed a (semi-) trailer. It speaks for itself that Italians also pay attention to the design of something utilitarian as a flatbed with dropsides. 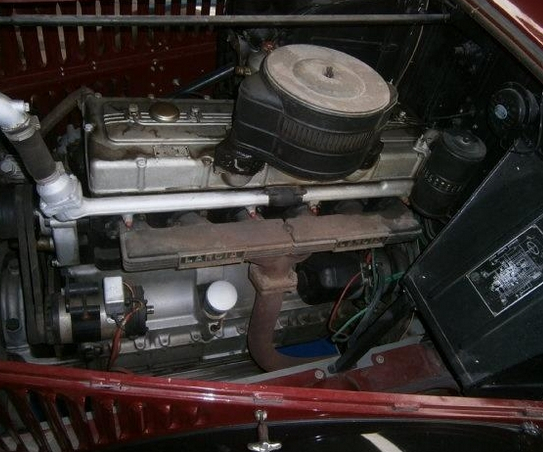 I found this picture of the Esatau’s cutting edge power unit, the Lancia tipo 864M diesel. An inline-six OHC 24v engine with an alloy cylinder head, a displacement of 8,245 cc and a maximum power output of 122 hp @ 2,000 rpm. Direct injection, naturally. In 1953, its displacement was increased to 8,867 cc, resulting in 132 horses. The Esatau’s transmission had eight forward gears (as in 4×2) and two reverse gears. After studying many images, I’ve come to the conclusion that this probably is a former Lancia 6Ro military truck, now wearing a civilian Esatau 864 outfit. Almost all civilian models I found had a sleeper cab and a radiator grille with a more pointy lower end. Here’s an original Lancia 6Ro military truck. The front bumper’s center section protected the radiator grille and for obvious reasons there were no shiny parts. Classic Lancia commercial vehicles? As sophisticated and gracious as the company’s cars of yore. “Ciao Bella”! I rarely comment on you articles, but they are awesome in showing vehicles I’ve never heard of and going over amazing details. I didn’t know there were 4 valve heads in diesel engines at that time. That engine looks very interesting. To begin with, it’s as neat as they come, no unwieldy cables or weirdly portruding accesories. This is what a truck engine would look if designed by Bugatti.. Thanks a lot, Johannes, and please go on with your great notes. I must say, this Italian beauty was quite a tough nut to crack. No license plate to check, no model designation, no info-sign on or near the truck and no memory to rely on. I’m positive that I never saw a Lancia truck in the Netherlands -or anywhere else- before. The information I found on the internet was in French and Italian. Especially my knowledge of the Italian language isn’t what it used to be…to put it very mildly. 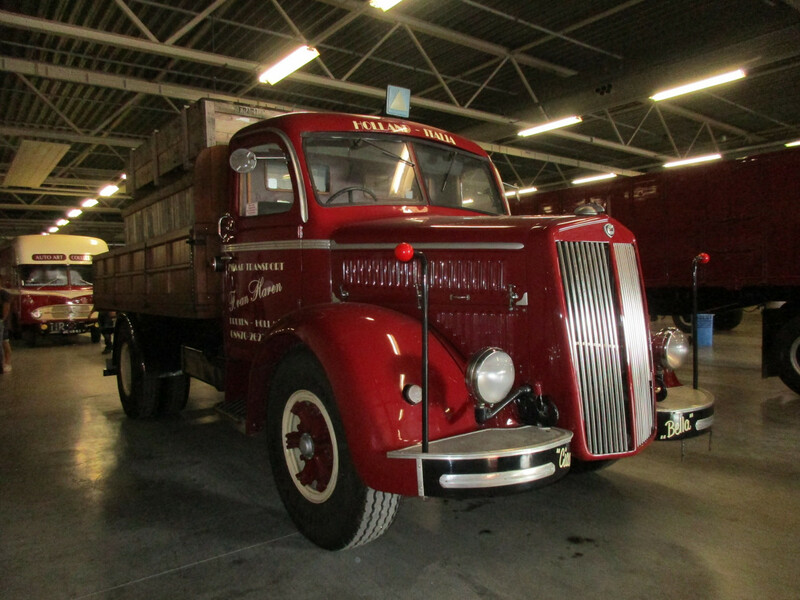 But it was worth it, what a looks and technology for a diesel truck developed in the forties. MASSIVELY different from the Cadillac 8-6-4. I have always dreamed of having a Lancia in my driveway. Thanks, Johannes! This is the one for me! This is an absolute gem! One of the most beautiful trucks ever. The engine is superb; the most beautiful truck engine I’ve seen. Looks like it could have come straight out of a luxury/sports car of the times, with all those alloy castings. I used to see a lot of trucks come through Innsbruck from the Brenner Pass, including Italian ones, in the 50s. They were mostly exotic to me, and it’s quite possible I saw one of these. Some of them I remember quite clearly, like the OM cab-overs. Did I see one of these? I’m afraid my memory isn’t perfect, unfortunately. Thanks for doing the research on this one. First of all thank you for maintaining this precious website. CC has quickly become the first browse of my day and deservedly so. Old trucks are not exactly in my comfort zone but I think you have spotted an OM Leoncino (lion cub). Add-on turn signals and the pop up windshield indicate that this should date back to the early Fifties. OM, Officine Meccaniche in Brescia (Italy) part of FIAT group since 1933, started producing these in 1950 as an independent project after building under licence a few trucks from the famed Saurer company. As far as I know engine (4 cyl. 3.8 liters) should also be of Saurer origin. Compact and reliable, the Leoncino was an instant hit suiting the needs of booming postwar Italy. A full range of 6 to 8 metric tons trucks sprouted from the Leoncino; they were all named after baby animals and soon became very popular. There was an OM truck for every need:small enterprises, building companies, bus companies, fire depts. Versatile italian coachbuilders unleashed their talents to satisfy every niche and the Orsetto (teddy bear) version could even be driven without a commercial driving licence weighing less than 3.5 tons. They survived till the Seventies under different designations when the OM brand (commercial vehicles) got lost in the IVECO galaxy. required to master the five speed column shifter and the non assisted steering. You can still occasionally find some late samples in rural areas, far enough from the rigors of smog controlled urban areas. Thank you for your detailed comment; it’s much appreciated. 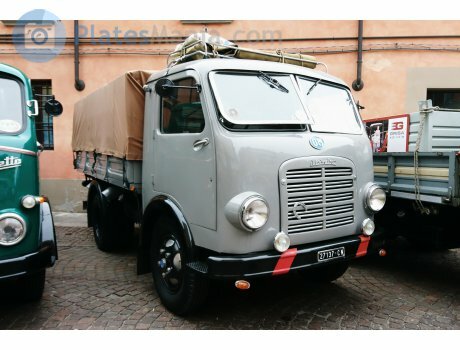 Yes, the OM range of trucks were once so common it Italy and surrounding areas. Five-speed column shifter! Now that’s something to master in the mountains! If you listen closely you can even hear the engine! So that’s how an Italian truck enthusiast sounds! Great video, especially when they’re zooming in on the 864 and its interior. Ahh, one showing the pointy-bottom grille and the sleeper cab Johannes told us about. Cool! This is indeed a beautiful truck! 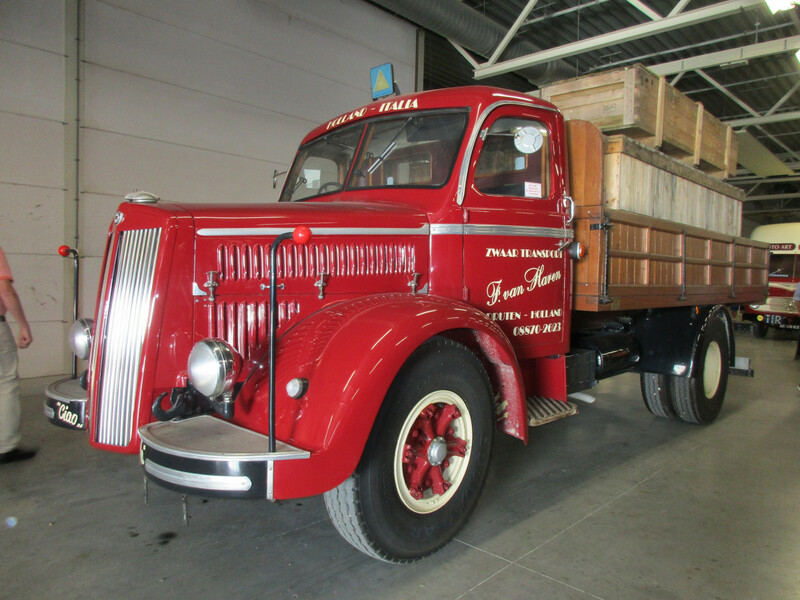 Was the front axle set back farther from the front a common characteristic of European trucks? Most American trucks put that front axle farther forward for a more car-like configuration. I would imagine that the need for greater maneuverability and a tighter turning radius dictated the European setup? Yes, both European conventionals and cabovers have a set-back front axle. Or better said: had, in the case of conventionals. 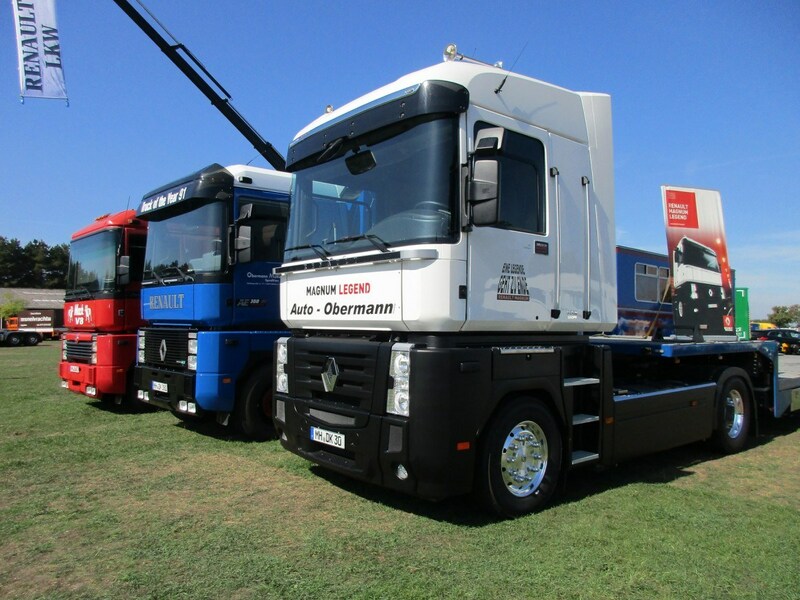 An example of an exception is the (out of production) Renault Magnum, the steps are behind the front axle, which is not the case with other cabovers. How nice, that’s what’s called a rolling chassis-cab….and all the guys are having a great time! Cool trucks and not something Ive ever seen before thanx Johannes, the engine is very advanced for the era OHC and multi valve diesel. I hadnt seen a Renault with a Kenworth style climbing wall entry either not my favoured way of getting into a truck I drove a K108 last week it was another reminder of why I like European trucks. Nice article as always, and that really is a beautiful truck. A very basic question, though: you refer to these as Lancia’s “conventional” trucks. How were they different than their unconventional successors? Was it the cab layout, or powertrain, or another characteristic? My truck knowledge isn’t what it should be, especially for the foreign brands. In truckspeak, “conventional” means with a traditional hood out front. There’s no “unconventional” in truckspeak, but there is COE (Cab Over Engine), and some other variations not so commonly seen anymore, such as “LCF” (Lower Cab Forward”). That’s got to be one of the sweetest trucks I’ve seen, with a sculpture of an engine to match. Glorious. 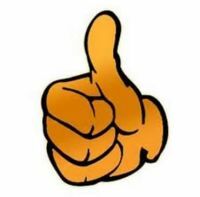 Great work indeed, Mr Dutch, grazie mille. Beautiful as the engine is, I wonder what the benefit of ohc and 24 valves is when the power peak is 2,000rpm? I always thought such features were for high-speed breathing? 1950, the second world war just 5 years over and Europe, especially Italy were economically on their knees. Lancia hardly got any governmental support contrary to FIAT who were helped by the government. This engine was developed out of inginuity, raw materials were expensive and hard to get, 2000 revs and 24 valves for a Diesel engine were biblical achievenents, lub oil was hardly as good as todays and 100 to 150 HP were magical power rates for trucks. A long, long time ago I drove THE truck of trucks: the F89 Volvo Turbo 6 cab-over. The genesis of the modern European truck. It had 250 proud horses in the late seventies and you were king. Today I see small chrome plates sayin’ 560 Hp on the cab doors of its grand children. Thanks for that info, Rammstein. As to ingenuity, knowledge of advanced valve gear and aluminium were in (unsupported) Lancia’s available skills to apply, probably almost easier for them to use than conventional. According to the information I found, the development of the Lancia tipo 864M engine started during the war. Because of allied bombings, the project was delayed. 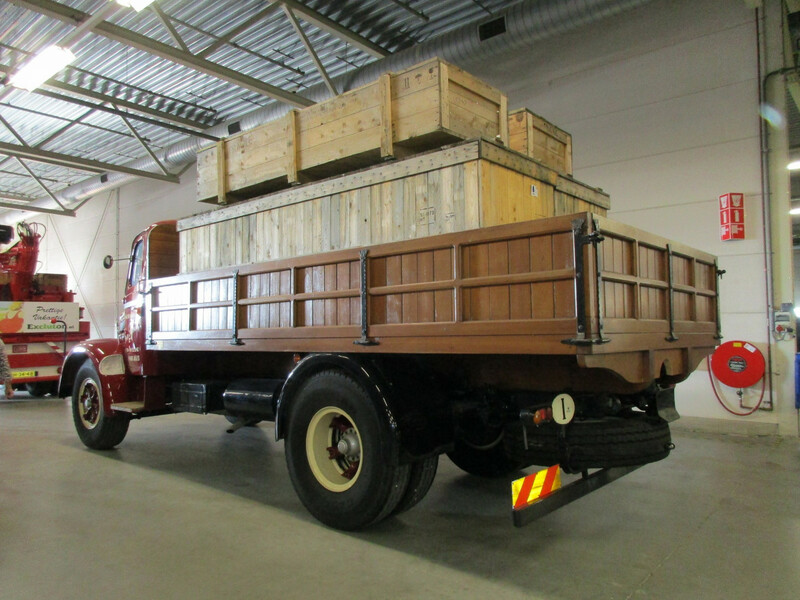 The Lancia truck plant was reconstructed immediately after the war, the 1947 Esatau 864 was Lancia’s first new post-war truck. 122 hp from a naturally aspirated diesel, with “just” 8.2 liter displacement, was an astonishing achievement for that era. I’ll give the random example of the Aus Ford 4.1 litre pushrod 6. When it got a cross-flow head in place of the US original in ’80 or so, it made about 220ft lb at 1,900 revs, and 126 bhp at 3,700. As it got more and more advanced valve gear over the years, it all rose, till the final 4v twin-cam version made 270bhp at 6,000 and 300lb ft at 3,250rpm. You’ll note the torque figure went up the rev range and increased by about a third, and the power went well up the rev range – but it more than doubled. It made more because it revved harder (power being torque times revs): it revved harder (largely) because it could breathe better. Truck engines now that you refer to are all very turboed (and have highly sophisticated fuelling) so getting big air in (and out) matters even when the engine speed is objectively low, hence their stupendous torque figures at perhaps 1,500 revs. Modern truck engines are such physically large engines that 1500-2000 IS high speed, particularly given the slow burn in diesels. Rammstein rightly points out that Lancia was using what it knew, as it had little cash, and that 2,000 rpm and 120 bhp on ’50’s fuel and oil was indeed “high speed” then. So yes, efficient breathing is important, but relative to engine type (diesel v petrol v turbo-diesel), OHC and 4 valves is still only important to speedy breathing. A bit late here, sorry. Great post on one of my childhood dreams. Thank you Johannes. I still remember those endless summer trips queing behind heavy smoking trucks on Italian twisty two lanes a long time ago. stuck behind one of these beasts doing 30-40 km/hour possibly on the Appennini or the Alps was almost a nightmare. Dad complaining about the smoke and the slowness, me in the back longing to see an Esatau and its long and mythological hood. A rare sight back in the early Seventies along with the Alfa Mille truck, but still alive in my memories. Great memories, Bruno. Thanks for sharing! 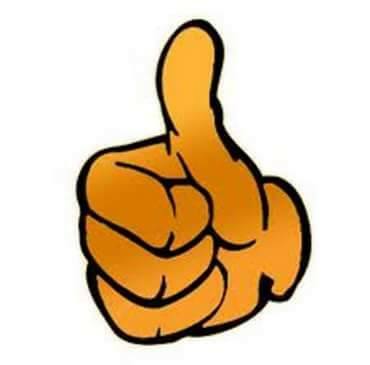 Yes thanks from me too – to both of you! Bruno, was it only the Italian trucks that were especially slow? I have been told that Italian cars benefited later on from having both the Alps and the autostrada to ensure they performed well in both conditions. John, every heavy Euro-diesel big rig was horribly slow in the first post-war decades. Mind you, I’m not even talking about serious hills and mountains. Somewhere between 150 and 200 hp was the maximum in the fifties. Things started to change with turbocharging (from the early and late fifties onwards, respectively by Volvo and DAF), bigger engines and from the early seventies onwards turbo + intercooling (1973 DAF 2800). And then you also had the German regulations: from 1960 onwards, at least 6 DIN-hp per metric ton GVM (32 metric tons max. GVM) and from ca. 1970 onwards, at least 8 DIN-hp per metric ton GVM. That surely helped. After 1970, that’s when heavy Euro trucks got some real power, as in at least 300 DIN-hp. The King of the Road -and mountains- was the 1969 Scania 140 Super (turbocharged, 350 DIN-hp) and the later Scania 141 (375 DIN-hp). John, as for trucks Johannes is far more expert than I am and he gave a thorough explanation. Yes, the Autostrada was a good proving ground and manufacters made good use of it especially until speed limits became the law. Today, automated average speed control and traffic congestion is such that it’s hard to find prototypes being tested, except maybe on the A22 around Modena where you can still see new model Ferraris and Maseratis put under testing. Stop and go traffic and speed limit made us appreciate automatics and we’ve started to make good use of cupholders. Let’s say that Italians didn’t benefit that much from high speed testing in the beginning since the average domestic car has been small, underpowered and overburdened for quite a long time: it was not uncommon to see four people in a Fiat 500 or 600 and luggage on the roof taking long trips. Amazingly, little FIAT 600 and FIAT 850 proved reliable and engines were not overheating even when launched at 100 km/h all day long. In keeping with domestic tradition cars were fuel and space efficient. Efficient cooling systems and brakes were also a priority in a country were monuntains cover most of the surface. Of course most people would have preferred driving a FIAT 1100 rather than a 600 but the tax burden every car owner had to sustain discouraged this. For decades registration tax was based only on displacement and anything above 2 liters was literally annihilated by taxes, VAT and so on. Of course, this affected our luxury car industry as well and many consider this a factor contributing to the demise of our luxury brands (mainly Lancia). Even worse, fuel price was (and still is) among the highest in the world. All in all new Autostrade drastically reduced transit times and commercial traffic benefitted from this. The construction of our first modern autostrada (Autostrada del Sole) , the A1 from Milan to Napoli was an epic engineering and social achievement. Never again in this country 755 km of road would take only 8 years to be built to the highest standards. As they say here at CC every car has a story. I’d say this would apply to our humble roads too. Wonderful looking truck. Thanks for sharing! 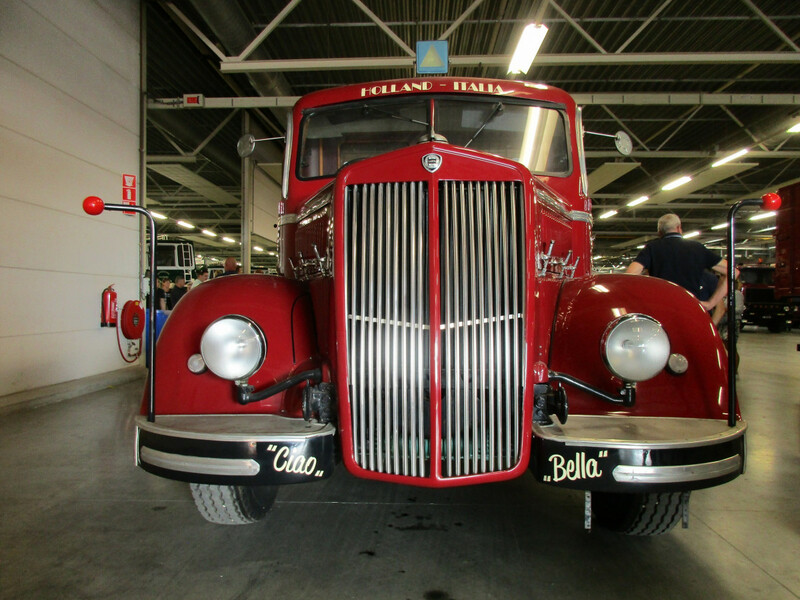 All we need now is an Alfa Romeo Romeo van…..